Last Wednesday and Thursday I had the pleasure of meeting two lively groups who took part in our Bigger Picture team building activity at the Longleat Centre Parks conference venue. Our day started with crew arriving in the morning and unloading all the equipment required..lots of for this highly creative team building event over two days!! 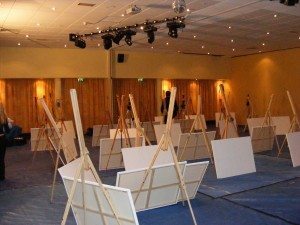 To ensure there are no spills on carpets, we stuck tarpaulin over the entire floor area to be used and then set up the easels with coloured t-shirts for each person and the canvases. Paint stations were then strategically placed around the room plus the large trussing to be used to place the final big picture on for all to view. Unfortunately for us, we only had an hour and a half to do all of this due to room logistics but our 6 person crew worked very hard and of course, were ready and waiting by the required time. whew!! The beauty of The Bigger Picture is that it can be totally tailored to best suit your company objectives through the pictures they paint. 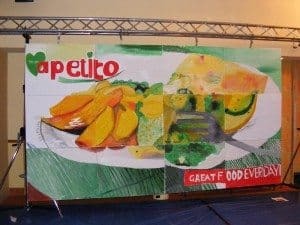 Our client was a food manufacturing firm and they chose 3 pictures for each day covering a food item, their delivery vehicles and delivering food orders to the public. Our creative team had then added their logo and a specific strap line to each one. The pictures are divided up into the necessary number of easels and each canvas is given their part to paint. If this sounds terribly difficult then believe me, this group proved that it wasn’t as they were so focused and enjoying themselves that the end product was really outstanding. Team Building Activity in Action! Once the participants arrived into the room, we divided the group into 4 on an easel and then after a quick brief they are given 15 minutes to sketch their section of the picture onto the canvas. During this time some of them will realise that they are actually part of the bigger picture and will then try and locate their neighbour canvases to get a good overall view. The hard part well there has to be a challenge!! 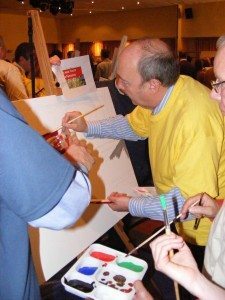 There are only 2 canvases allowed together at any one time so keeping an eye on the other canvases during the activity can help to keep the flow of the picture going. The Bigger Picture is a superb team building event and can be done over 1.5 to 2 hours. Our client however, had a very tight schedule so on each day, we had to brief and complete the activity with 130 people in just one hour and then we had half an hour to hang the 3 x big pictures and cover with cloths ready for the unveiling ceremony, blood, sweat and tears passed over our crew but we did it with minutes to spare!!! Well done to Sarah, Mike, Denise, Austin, Dave for a great two days. We have had great feedback (which we will add once she has collected all the feedback forms) from the client with a request to look into how we can beat this for next year’s event and comments will be shown on our new review page on the website shortly.